What was previously summarized as innosabi crowd (or simply the innosabi software) are now four stand-alone solutions that divide by application area and user group: one for working with customers on new products. One for speeding up internal innovation projects and collaboration inside the company. One for the evaluation of employee ideas. And one for the integration of suppliers and expert networks in the innovation process. One motif that has accompanied the innosabi brand and product presentation for a long time is aerospace and the cosmos. It embodies the pioneering spirit, the look into the future and the technological progress that we pursue with our corporate philosophy and our vision. The decision to look up names for the new software solutions from this very field was therefore rather obvious. A platform that looks far beyond the boundaries of ones own company. It helps to discover customer needs and new product ideas and therefore brings customers closer to the company. It makes previously hidden details visible. As a telescope provides us with important insights into distant galaxies and planets, innosabi telescope generates the necessary insights to drive customer oriented innovation. A platform that provokes ideas to spark within the company. It helps to ensure that suggestions for improvement are heard and can fully unfold. It ignites the potential of one’s own employees and makes innovation part of the corporate culture. As a single spark can trigger major changes, innosabi spark ensures that employee suggestions shape the company. A platform that binds suppliers and experts more closely to the company. It helps to attract knowledge and innovations from the immediate, professional environment. It builds strong relationships for innovation and brings external potential within reach. As satellites orbit around a planet, innosabi orbit makes the company a hub of far-reaching networks. A platform that accelerates innovation projects. It helps to prioritize the promising ideas and to implement them with the necessary resources – seamlessly, fast and efficient. It enables more speed and collaboration in the enterprise. As a launch pad lets a spaceship take off, innosabi launch pad lets the innovation process pick up enough speed to break through. The imagery for the new logos takes up the names and emphasizes additional dimensions of meaning for the individual products. And because that was not challenging enough for us, everything should, of course, be based on logically linked visual elements: uniform, geometric shapes. The dominant form of the telescope logo is a hexagon. The outline and the inner section form this shape. A closer look reveals that the shape does not consist of a single surface but is formed by individual triangles. This style element is not only found in the telescope logo and symbolizes one of the core elements of our philosophy: innovation is created above all where the right elements come together and become more than the sum of the individual parts. From several, relatively simple triangles becomes a complex hexagon. The second meaning of the logo includes the representation of the name. The opened hexagon – especially in combination with the triangular elements – shows slightly abstracted the aperture of an camera objective. The most important building block of a telescope. At the same time, the aperture of this panel contains the third meaning of the logo: A ring forms around the center of the logo. A ring that seems to expand. Just as the telescope software enables companies to search for insights and ideas far beyond their own borders. To represent the eponymous spark in geometric shapes, we have chosen a triangle. Although a spark itself is rather informal, the triangle embodies many of its main characteristics: in particular spontaneity and the direction in which it leaps. The triangle runs pointedly upwards and, like an arrow, implies a clear dynamic. The uniqueness of this direction of movement reflects what constitutes the platform in the classical idea process: to move ideas from A to B efficiently. But unlike telescope, these elements are not other geometric shapes, but congruent triangles, which become larger outwards to the overall shape. Once again, the process idea of ​​the spark platform is highlighted. At least as important, however, is the abstract representation of a flame, which is triggered by the eponymous spark and emblematic of the drive for innovation and enthusiasm that should be kindled in the employees. Unlike telescope or orbit, the spark logo is a solid surface. The difference between the areas of application of the software solutions is thus visualized as well: A platform that fills the company inwards and invigorates – just as the logo itself is closed. Finding a suitable geometric figure for orbit was easy. However, putting the meanings and features of the orbit software into it was much more difficult. The orbit software is characterized by the fact that external experts or suppliers are closely tied to the company. They are put inside the company’s orbit. With this one logical focus, the visual distinction between internal and external platform becomes clear again. But the design of the logo also starts at a different location. Above all, the direct involvement of suppliers and expert networks has the goal of creating speed. The color gradient and the appearance of the ring as two nested rings – the continuous motif of the product branding – creates the impression of movement. The ring seems to rotate quickly. On the one hand, this rotational movement illustrates the speed that orbit offers the company. On the other hand, it also describes the interaction between companies and the involved external partners. Just as the ring turns inexorably, orbit brings innovations into the company, which in turn also benefits the entire environment and drives it to further progress. 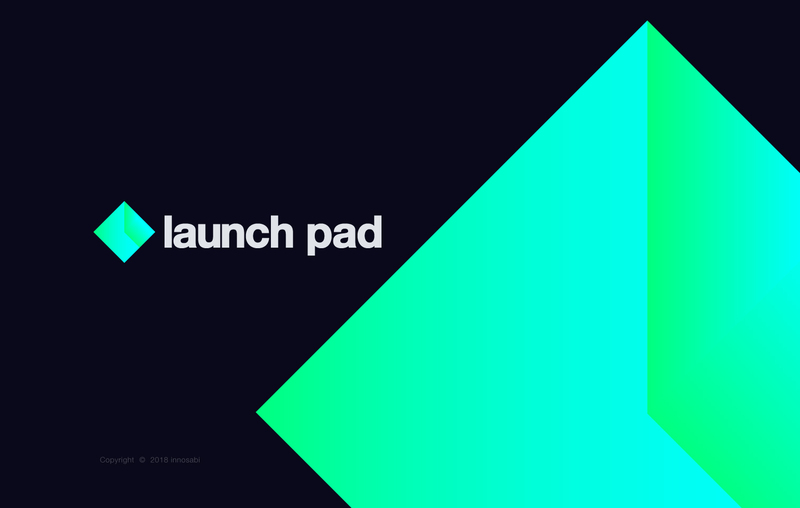 To visually represent a launch pad is not that easy. Unlike orbit, there is no universal symbol for it. Therefore, we have deliberately decided not to recreate it visually, but went a different way. We see launch pad as a place where good ideas can start. A free space in which potential can unfold. Much more so than just the literal platform for rockets, the chosen square represents this playground. We also rotated it by 45 degrees to create an interesting dynamic similar to orbit and spark. It reflects the speed provided by the launch pad software. This dynamic is further emphasized by the color gradient. If you take a closer look, you will also notice smaller elements in the launch pad logo. A slightly raised corner gives the entire logo a clear resemblance to a classic pie chart. This association highlights one of the core elements of the launch pad software: the efficient, collaborative distribution of resources to deliver promising ideas. The concrete arrangement of this cut also awakens a clear association with two clock hands of a stopwatch, because as with all other solutions, launch pad is all about one thing: speed. The entire color scheme of the product logos has a very high priority in the design concept. As a universally understandable visual feature, the colors are essential in reorienting the innosabi product strategy. 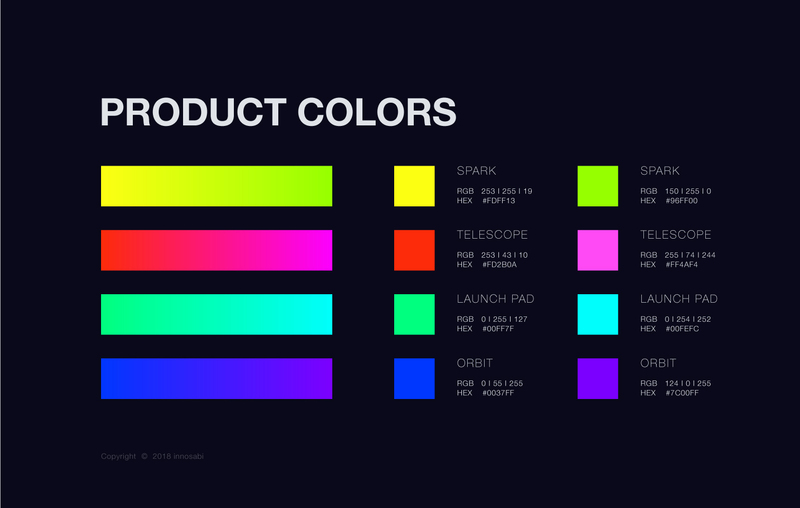 In order to emphasize the distinction between the individual software solutions and to emphasize the differentiation of the software into a four-part portfolio, we deliberately opted for very strong color palettes. Through strong contrasts and saturation, they create the dynamics and agility that we associate with innosabi and our software. Each software solution has its own clearly defined color palette, which is not only reflected in the logos, but also in every other communication relating to the respective products. The color palettes are chosen so that they have the greatest possible radiance. Both literally, in terms of the luminous effect of the individual shades, as well as the memorability as a unique selling point. Especially for people who have not yet dealt with innosabi and our methods in detail, a differentiation of the individual solutions is difficult. The very present color helps to emphasize differences and to assign new information immediately to the right solutions. The bright colors are rarely used extensively, but used selectively. One factor is especially important: the background. We have decided in the new innosabi design for a consistently dark theme. All bright and colored accents emerge even more through a perceived glow effect. Like stars or distant galaxies in the night sky. In full harmony with our overarching universe motif. Even for experienced users, the color scheme should provide better orientation for the future. Our goal is to create our own “world” within each software. The user interface and interface for Platform Admins can be optimized for more intuitive use by deliberately using the associated color scheme. In particular, when using several innosabi platforms in a company, the colors provide unambiguous information about the respective field of application. There was one big question that we had to ask ourselves after working out the individual product identities: “How does all this fit together?”. Because our goal was not to brand individual products, but an entire product family. Although each solution is technically independent in itself and clearly separated from the others by logos, colors and descriptions, the full potential of the software lies in the interplay of the individual solutions: our idea of ​​the digital infrastructure for innovation. To visualize this as a superordinate message required some abstraction and thought experiments. 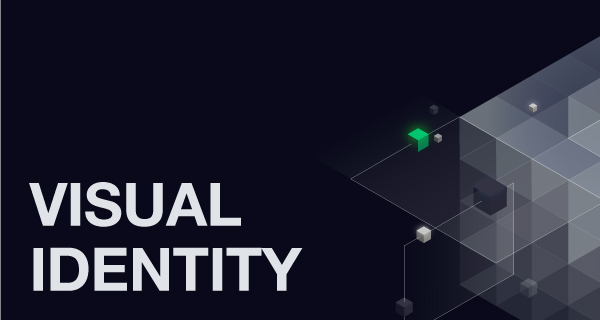 The first step was to demonstrate the breadth and penetration of such a digital infrastructure throughout a company’s ecosystem. Neither a two-dimensional nor one of the familiar three-dimensional figures could convey this sufficiently. 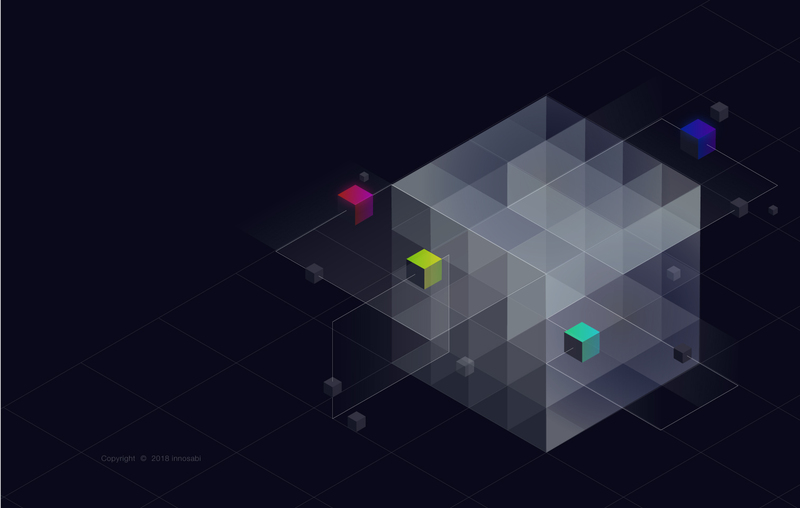 Therefore, we have used the (abstract) dimension above and taken a tesseract as a template. The three-dimensional projection of a four-dimensional cube reflects the desired all-encompassing and penetrating character. The second step was to combine the basic form with the overall theme of the product identity: the combination of individual elements into something bigger. The logical, next “smaller” level of the tesseract is the classic cube. 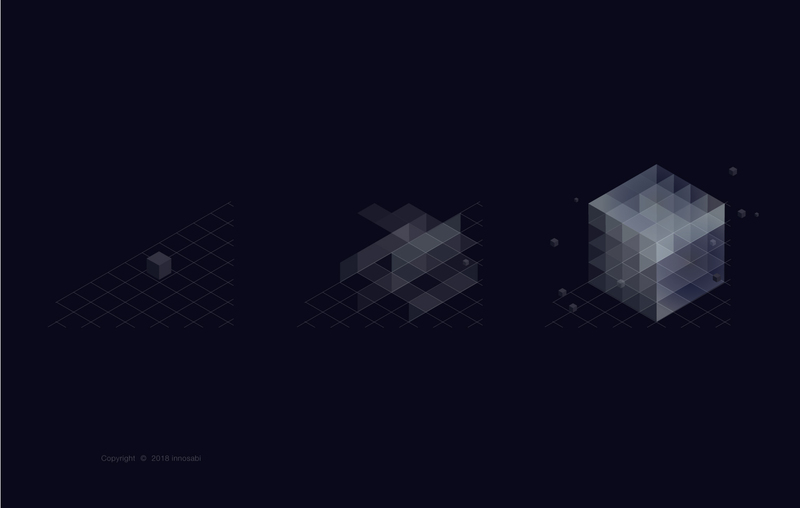 As an elementary building block for the representation of the product family in the style of the tesseract symbolize in large numbers the different components of an ecosystem for innovation. From different companies and data to people and ideas. Together they form something bigger. The third step was to integrate the individual software solutions. We deliberately chose not to use the elaborated logos, as this would weaken the overall character of the basic form. Thanks to the clear and easily recognizable color scheme, this wasn’t even necessary anyway. We understood the individual software solutions in their respective colors as a connecting element in the collection of individual cubes. They form the ecosystem and create connections that go beyond directly adjacent elements. The internal and external orientation of the respective solutions are represented by the paths on which the colored building blocks run through the ecosystem. orbit and telescope move significantly outside of the tesseract, whereas launch pad and spark turn inward. With empty minds from thinking and tired hands from sketching, but bursting with pride, we present the next major milestone in the history of innosabi – the new product branding.